Skydiving isn’t a fashion contest. Any clothes that you are comfortable in should be fine. 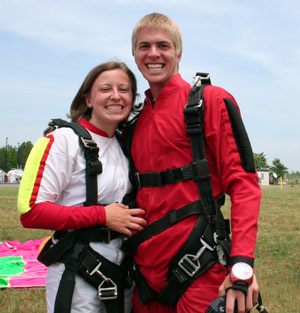 Loose fitting clothes will likely allow you to be more comfortable during your skydive. The drop zone will should provide jumpsuits that cover your clothes. For the ladies, no dresses or skirts. Most people wear shorts and a t-shirt in the warmer months. On cooler days, jeans and a sweatshirt will help keep you warm. If it’s cold, the drop zone should provide gloves. Sneakers or similar soft soled shoes work best. Sandals, high-heels, flip-flops and other shoes that can easily come off and can’t be worn. The shoes must be tight and able to stay on when free falling at 120 MPH. Shoes or boots with hooks are also not permitted as they have the potential to snag the lines of the parachute when it’s deploying. If these are the only shoes you have, the drop zone may cover the hooks with tape. It’s best to leave jewelry at home. It could easily be lost during the skydive. If you are wearing jewelry, it’s best to give it to a friend or family member for the jump. Watches cannot be worn during the jump. Even necklaces that that are long and are likely to stay in your shirt should be removed. There’s a lot of wind at 120 mph and a gold chain flapping in the breeze could be dangerous. The drop zone will provide a helmet for all tandem students. Most drop zones use soft helmets called “frap hats”. Few drop zones use hard helmets. This is due to the risk to the instructor. While extremely rare, it would be possible with a hard helmet to knock the instructor unconscious. If you have long hair, you should plan on pulling it back or putting it into a pony tail. Some people prefer to tuck their long hair inside their helmets. It’s important to keep your hair out of the instructors face. The drop zone will provide goggles for all students. The goggles protect your eyes from the wind. If you wear prescription glasses, you can either jump without your glasses, or put on goggles over your glasses. Be sure the goggles fit tight and comfortably on your face to keep your glasses in place. If wear contacts, be sure to tell your instructor so they can be sure the goggles are tight against your face.